Make Flying Geese units quickly, easily and accurately, four at a time! You never cut a single triangle, but with the Ultimate Flying Geese tool you end up with perfect triangles in your finished blocks every time. 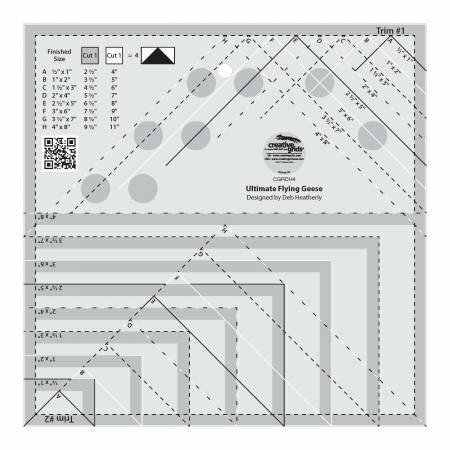 Create eight sizes from 1in x 2in up to 4in x 8in finished blocks - the cutting requirements for each size is printed right on the ruler! Or, use your favorite method and create over-sized units... then trim them down to perfection. The ruler slides easily over the fabric until pressure is applied. Then, our exclusive gripper holds the fabric in place while cutting, eliminating slipping and miss-cuts!